Knoco stories: The Risk Radar - what could possibly go wrong? The Risk Radar - what could possibly go wrong? Michael Mauboussin, in his book "Think Twice", talks about the planning fallacy, and compares the inside and outside view. 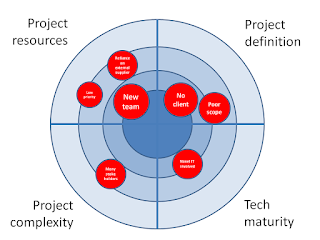 He points out that people planning a task or a project tend to take the inside view - they think through how they will do the project, they think about the risks and challenges they will face, and how they will overcome them, they add up the times for each step, and use that as their baseline. Almost always they are over-optimistic, unless they also use the outside view, and calibrate their baseline against what usually happens. If you want to know how something is going to turn out for you, look how it turned out for others in the same situation"
To find out what happened to people in similar situations, we can use Lessons Analysis. If you have an effective lesson learning system you may have records from hundreds or thousands of past projects, and you have a huge database of "how things turned out". Through lessons analysis you can recognise common themes across a number of lessons, and see the challenges and risks that projects are likely to meet, and identify those which are most common and most impactful. You can then use these to create a risk radar for future projects. In the 90s, I was in charge of a lesson-learning system in Norway. At one point we had lessons from over 300 projects in the system, and we grouped them into a series of "things that commonly go wrong in our projects". Any project where more than one of these was true had "Danger on it's Radar". A few years later, the organisation applied the same concept to big engineering projects, and came up with what they called the "Train Wreck Indicator" - a similar indicator based on common reasons for failure, determined through lessons analysis. Any project that scored a Red Light on the train wreck indicator was given additional help and oversight in order to help it steer a path through the problem areas, and avoid becoming a train wreck. If you have an effective lessons learned system, and are building up a library of project lessons, then consider a similar analysis, to build your own "Risk Radar".